It’s time to finally review the greatest TV show of all time. Even better than Cardfight, Digimon, Pokemon, Justice League, Avengers, Sword Art Online, Attack on Titan, One Piece, Naruto, Bleach, Trigon, Full Metal Alchemist, I love Lucy, The Odd Couple, Twilight Zone, The Honeymooners, Teenage Mutant Ninja Turtles, Barney, The Powerpuff Girls, Breaking Bad, The Big Bang Theory, The NFL, The Walking Dead, Dr Who, Star Trek, Star Wars, Godzilla, even the original Yugioh. This show beats them all and that’s a pretty incredible feat if you ask me. 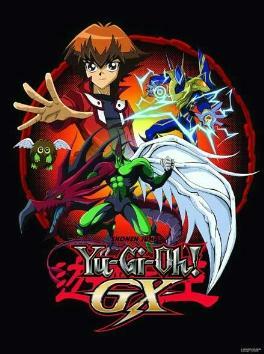 Yugioh GX just had all of the necessary traits of a great show and the stakes kept increasing as the seasons passed. It all starts with the terrific characters and continues to the legendary music. Prepare yourself for the ultimate show, for Yugioh GX! There are 4 seasons and typically they each have one arc, but the third season is so good that it has two. The series revolves around a kid named Jaden Yuki. It takes place sometime after Yugi’s big win over the forces of evil in Millenium World and he is now travelling the world. (Probably to win more tournaments) Kaiba left his mark on the world by creating a Duel Academy, which Jaden is a part of. He only barely gets in since he was late, but Jaden quickly beat the Professor in a duel so they had to let him join. There are three dorms and they are based on the Egyptian God Cards. The Slifers are the lowest rank and then you move up to Ra. Finally, the elites go to Obelisk and then you get ready to leave. Jaden tests the waters by crushing just about everyone at the school. That’s when the plot really starts as the Dark Riders attack the school. They have quite a few members, but Jaden is backed up by his (un)dependable friends so that evens the playing field. “All he does is win” is a trait that can be applied to Jaden as he takes on the group. We get some one shot episodes in the 2nd season before the plot truly begins. They do help bolster the hero ranks though since we get some new characters like Hassleberry. A new rival also appears in the form of Aster. He uses a mysterious group of cards as his deck when he fights seriously and Jaden counters by switching up his hero deck into a Neo Spacians one. He now uses a lot of aliens in combat and that will come in handy since a cult has arrived. They wish for everyone to see the light and they do this by defeating duelists. When you lose, you become brain washed and must do The Light’s bidding. Sartorius goes after Jaden’s friends and that’s where he made his big mistake. Jaden’s going to have to show him what it means to duel a pro. Season three decides to start off with…more new characters! A tournament is held so that the old veterans can fight the new guys so Jaden quickly takes them to school. Unfortunately, it appears that these newcomers may not have arrived for fun and games. The new teacher seems like he’s up to something, but he definitely picked the wrong school to mess with. Jaden isn’t playing games now and he’s going to take the win as always! He also heads to the world of the Duel Monsters where he gets to duel a mysterious being named Yubel. This is where things start to change. One of his friends didn’t make it back out of the world so Jaden decides to go back in. His friends quickly jump at the chance to help, but little do they know that they’ll just get in his way. It’s too late to turn back now though so they head into a dark world filled with the sorrows of many characters. Zane and Aster have been fending for themselves for a while and Jaden realizes that even his skills will have a tough time getting through this. Can he take on the Supreme King and stop Yubel or was it all for naught? The ultimate tale of heroism and determination is finally here. Jaden’s adventures were not done yet though as the final season began. Mysterious beings of darkness appeared to destroy Jaden’s friends one by one. The friends resisted since they’ve seen this tune before, but it is all for naught. Ultimately, Jaden has to step up and use his newfound abilities to take these guys down. He’ll have to duel the ultimate being, a foe even stronger than Zorc if he wants to win. Knowing the stakes at hand, “All he does is win” will need to be true in order for Jaden to rise to the top. I realize that the plot sounded awesome so you can probably tell why this is the greatest TV show of all time. Don’t worry though, that’s just the beginning. Another one of the reasons why this show is awesome is the great soundtrack. Just about every theme is a nice guitar/rock theme that works very well with the duels. They’re all very heart pumping so you really get excited about what’s going to happen next. It’s no stretch to say that it does have the greatest soundtrack of all time. I would expect nothing less from the show and it’s all thanks to the dub. I’ll admit that I’m not crazy about the original music. There’s one really good track there and a couple that hold their own, but nothing beats the American version. It probably would have still been the greatest show of all time anyway, but the music really makes a difference. Next up, Yugioh GX also had some stellar animation. Season 4 is clearly a cut above the rest and I definitely liked Jaden’s new hair style. You could tell that he was a changed man and his abilities were also a nice improvement. That being said, Season 3 also looked really good and the colors are vibrant. Season 1 had its charm since it was the original and the characters looked a whole lot younger. Season 2 was pretty close to season 1 in animation and definitely held its own. Watching the show’s animation transition as it went from 1 to 4 is pretty cool. The characters grew older and their personalities also began to change, which was fun to see. Jaden certainly had a lot of development, but he never stopped being a downright awesome character. GX had another big thing in its favor when it came down to the writing. Yugioh GX had a pretty light atmosphere going for it during the average episode and then it would quickly transition into a darker theme. The average show would just create a fake light tone by adding in as many jokes as they could before things got serious. Look at the dialogue in Pac Man or Hulk and come back to me. That kind of thing wouldn’t fly in Yugioh GX and it always stays classy. The light tone is natural since the characters just want to have fun dueling. It is their biggest hobby and they’re serious enough about it to go to a school just for the card game. That’s dedication and it makes sense that they want to play. It’s easy to lose sight of this when the fate of multiple planets is hanging in the balance, but they always give it their A game. I also give the show props for the fact that there isn’t really any fanservice in it. There’s a very quick bath scene in arc 1, but 4Kids quickly helped us stop that and it never really came back. I was pretty proud of GX to say the least since it would be easy to try and add some in today’s culture. Many shows have it, but GX stayed firm and decided that they were going to operate on a high level. That takes guts and character, both of which GX ends up having in spades. The show’s new addition to the dueling system is also my favorite. It’s much better than the whole concept of Synchro Summoning and I prefer it over the Numbers system of Zexal. Merging monsters is the big deal here and while that was mildly featured in the classic series, it has been refined since then. Merging monsters doesn’t mean putting a swordsman on a dragon and calling it a day. Now, you’ve got a lot of cool hybrid monsters as a result of fusion. Jaden is known as the fusion master and he uses a whole lot of them in his deck. I like the fusion idea and since it plays a central role in the series, that’s good for me. Flame Wingman is one of the best examples of a fusion done right and he’s a pretty awesome card with a cool special abilitity. We can’t forget that Jaden Yuki is also one of the big reasons why the show is so good. He’s a great main character and an even better person. He always has fun when he’s dueling and he definitely doesn’t back up from any opponent. No matter how tough or intimidating they may look, that won’t deter someone like Jaden. He’ll keep on fighting all the way until the bitter end. The serious duels do start to take their toll on him though and he begins to have less fun once arc 3 hits. To his defense, all of his friends were murdered in that cruel world so he didn’t really have a whole lot of reason for hope. This didn’t just happen once by the way since they are all taken down again in season 4. 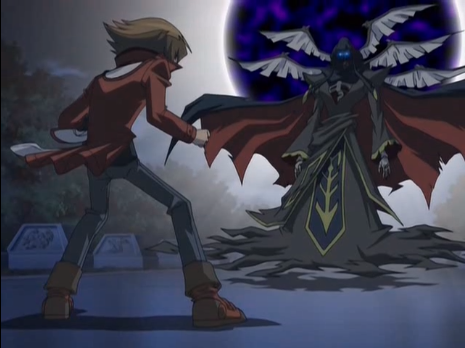 He starts to rely on the power of darkness a little more as he is able to use the Supreme King’s power from within and then he also gains Yubel’s abilities for season 4. He becomes more of a loner like Batman who protects people from the shadows and may seem like a pretty cruel person to others. It’s all just a facade though as he’s still out to help his friends. 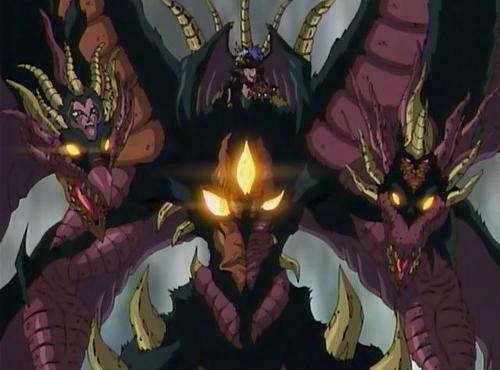 In season 3, he decides to become “a devil” to save his friends during one of his final battles. It depends on the translation though and what’s really happening is that he decides to use the forbidden Supreme King ability to fight even though it’s pretty risky and soul damaging. Risking one’s life to save someone is one thing, but risking your soul is definitely another. Jaden’s the kind of friend who will do anything to save an ally, which is why he’s such a great friend. I find his allies to be rather ungrateful sometimes, but it can be hard to appreciate what you have until it’s gone. Alexis in particular looked pretty bad during her team up with Jaden in season 4. They were winning and Jaden wasn’t really being that rude so it was a bit of a stretch for their disagreement at the time. Either way, Jaden’s a winner. He goes through a lot of changes as the series progresses, but he ultimately sees how fun dueling can be once more as the series comes to a close. Dueling is something that Jaden will always be doing and it’s one of the reasons why he is so much better than Yugi, Yusei, and Yuma. He has the most passion for the game and I dare say that he’s been through tougher situations than the other main characters. Jaden is definitely one of the best characters of all time and he elevated this show to the next level. Another great thing about GX is that it doesn’t just have an interesting cast, but it also makes sure to bring characters back from the original show. Did you miss Yugi and Kaiba? Well, they both return for guest star roles/cameos. Kaiba doesn’t actually get to duel, but he looks as good as you would expect. Yugi gets a pretty big role at the very end of the show and it was a pretty legendary moment. They definitely looked as good as you would expect and we get a lot of references and appearances that let us know that GX is still relevant to the original days. This is something that 5Ds and Zexal dropped the ball with as they decided that they would have nothing to do with the old days. This is an edge that GX has and it won’t let it go so easily. All right, let’s look at some of the characters in GX. Syrus is a kid who looks up to Jaden and eventually he learns how to be a brave and capable fighter. He’s not my kind of supporting character since he typically drags Jaden down with his lack of dueling ability. He means well, but he opposes Jaden sometimes to show how far he’s gone and it always makes him look bad. He got a lot of development, but it didn’t win me over. The Chazz is a character who actually regressed thanks to his character development. He has a crush on one of the other heroes, which becomes a pretty big thing as the series goes on and it really hurts his dueling ability. He was around Jaden’s level when the series began and he’s not even close by the time that the series ends. He is even reduced to wearing a chicken costume on national television in his final big episode. He was one of my favorite characters in the beginning, but he definitely lost his edge. Alexis is one of the main characters who arrived in season 1 and stuck with Jaden and the others all the way through season 4. She may not have gotten as many duels as you would expect, but she’s a pretty likable character. She challenged Jaden in one of the earliest episodes and she tries to help against the villains when needed. Ultimatly, the supporting characters rarely manage to actually help, but they do tend to surprise you once in a while. Her deck lacked firepower, but that doesn’t stop her from giving the match her best effort. She’s certainly an improvement over Bastion. He started out as the genius of the series and then he fell all the way down to the comic relief role. It may not have been all that bad except that he was used for comic relief in a crush role and it doesn’t get much worse than that. He got lost in the desert and he continues to prove himself as a very unreliable friend. I’m not sure why the writers decided to mess with him so much, but he definitely became one of Jaden’s worst friends. GX is so great that it has two big rivals for Jaden. Aster shows up in season 2 and he gets to duel Jaden at least 3 times in a very short period of time. He’s pretty full of himself when he first starts out, but Jaden quickly puts him back in his place with his new deck. Aster may not be quite as good as Zane, but he’s still a pretty great character and he’s one of the better GX fighters. You could say that Jaden has a third rival in the form of Jesse, but he came into the show during season 3 so you could say that he arrived a little too late. He’s a pretty likable character, but the show tries to make him a little too similar to Jaden. Highlighting their differences would have made it easier to like him as a character. I was never impressed with his Jewel deck either and I believe that it holds him back. It’s thanks to Jesse that we did have a fun 2 on 1 climax duel in season 3 though so that was pretty cool. He’s certainly better than most of the other supporting characters. Professor Crowler is a character who is always in the background, but he rarely ever does anything important to progress the plot. He duels a few times, but he always loses and he’s not a great character. I never found him to be particularly funny and while the show tries to convey to us that he is a good guy deep down, we are never given a reason to care. Crowler is around, but his role is basically filler. Professor Banner’s role is definitely not much better, but his saving grace is that he actually gets a super form at one point. It’s pretty great and truly fitting for a Yugioh boss. The moment was notable and it gave Banner a lot of personality, but he was ultimately doomed to a similar fate as Crowler. He just wasn’t interesting and letting him fade into obscurity was fine by me. Hassleberry was a pretty decent friend. His dinosaur gimmick could be a bit much at times, but he was still an improvement over the other characters. He tries hard to secure victory for his team and he has a lot of confidence. What he lacks in character development, Hassleberry makes up for with his passion for the game. He never becomes one of the top players, but he gets a good amount of duels. Atticus is actually a pretty minor character even though he’s related to Alexis. He becomes Nightshroud once in season 1 and he does so again in season 4, but he never became one of the big villains. He’s mostly relegated to background status and the manga fleshed him out more than the anime. His role is probably smaller than Crowler’s and that’s saying something. He’s not my kind of character. Axel is one of those characters that I couldn’t get myself to like. It was probably a mix of hype and overconfidence on Axel’s part that made me grow weary of the character very quickly. He just wasn’t interesting and I really didn’t like his duel with the Supreme King. Axel just rubbed me the wrong way and I wasn’t crazy about the fact that he sort of became a main character. He even got an origin story at one point and I knew that the series had gone too far. Jim is another one of the transfer students from season 3, but he got less character development than the others. His eye came in handy at one point, but that’s really the only big contribution that he made to the series. He’s a nice guy, but he just seemed a little outmatched. Gecko let power consume him and he became one of the antagonists in season 3. It was almost sad watching him go up against Yubel since you knew that he was doomed. It was similar to the Shademan vs Laserman scene from Axess, but even more lopsided. That being said, I wasn’t a fan of Gecko so I was waiting for him to lose the entire time. He had no real reason to turn evil and the power corrupted him pretty quickly. He got to humiliate Chazz before he left, but that isn’t anything new at this point. Gecko’s Exodia themed deck was definitely pretty neat though. Chumley is a character who was written out of the show after season 1 or 2. He liked to eat a lot and he had the famous “Now I know what a grilled cheese feels like” line, but that wasn’t enough to make him a good character. He had one of the worst decks in the entire show and you never got the feeling that he actually improved a lot. It’s a good thing that he decided to pursue another career since he wasn’t making a whole lot of headway here. Ah well, we can’t have all of the supporting characters be too cool right? Blair is a supporting character who didn’t get a whole lot of development. She just popped up one day and stuck around for the end of the series. She’s a decent duelist, but she doesn’t get a whole lot of chances to show off her skills. She seems like a nice kid and she realizes that Jaden is one of the best in the biz. While Blair was likable, it would have been nice for her to have had more of a role. She does help to introduce Marcel, who ends up becoming the vessel for Yubel. That is really it for Marcel’s character though since he’s basically being used the whole time. Trueman seems to be a tribute to Agent Smith from the Matrix. There are many Trueman who haunt the multiverse and their dueling abilities are not to be underestimated. Aside from Jaden, they seem to be a match for just about any member of the heroes. Their dark cards are simply that tough and their supernatural abilities give them an edge over the average foe. Their sheer numbers is enough to discourage even the bravest of opponents and they made for pretty fun villains. Yusuke is a mysterious antagonist who appears in season 4 and there is more to him than meets the eye. He was never a great character and he probably got one plot twist too many, but he’s another classic case of someone who went to the darkness for power and was unable to return with his personality intact. He’s pretty confusing and he is not as intimidating as the other villains, but he’s still a pretty cool figure to face in battle. All of season 4’s villains had a dark theme about them and Yusuke was no different. The darkness certainly gives him some cool points. Kagemaru is the final boss of the first arc. He is overshadowed by the other three, but that doesn’t take away from the fact that he’s a pretty great villain. He fits all of the classic Yugioh tropes as he’s really built. It’s a running gag at this point that each Yugioh series has to have a villain who’s really muscular so it can look even funnier to see the guy playing the card game. Since the other three villains weren’t buff, you could say that Kagemaru saved the series from missing out on the gag. He had the three sacred beasts, which made for a pretty powerful deck. He didn’t have a lot of character on his side, but he was a cool villain anyway. Camula is one of the Shadow Riders and she’s pretty notable since she gets to duel 3 times. That’s pretty unheard of for a mere minion and it was pretty emberassing for the heroes. I loved the arc because it destroyed the concept of teamwork in GX. Jaden basically had to beat the entire team on his own since his partners just couldn’t get the job done. Camula has some special abilities since she seems to be a vampire and she’s certainly one of the more dangerous members of the Shadow Riders. I can’t say that she’s a great character, but at least she can duel. She has more character than most of the other Shadow Riders. Nightshroud is the final boss of the series and you can really tell by his epic design. He is basically darkness incarnate and his power is absolute. It’s totally hinted that he could just end the planet and maybe the galaxy if he wanted too, but he chose to duel Jaden first and that was his big mistake. It’s a bit of an honor thing since not dueling would prove that he doubted his abilities. He definitely had a lot of over powered cards at his disposal and he was worthy of being a final boss in the Yugioh franchise. He definitely did a good job of weakening the heroes and Nightshroud is a villain who shall not be forgotten as time goes on. From the 4 big villains, he’s definitely the second best. Sartorius is the big boss of season 2 and he was definitely a lot of fun. He’s pretty similar to Marik since he practically transforms when he enters rage mode. He uses a lot of light based cards and I’ll admit that they don’t look very fearsome. They are tough to be sure, but you never get that flight or fight instinct that the other villains may trigger. Sartorius is definitely a villain to be taken seriously and I liked him, but his appearances should have ended with season 2. He gets a brief role in season 4 and it is not very flattering. Ah well, making that season transition can be tough for some characters. Yubel’s the ultimate fighter of season 3 and she’s definitely my favorite end boss. Her origin story is definitely pretty sad since she’s marooned in a far away place with no other sentient beings. It’s definitely a pretty tough fate so you can see why she heads over to the dark side for her revenge. In her true form, Yubel is virtually unstoppable. Simply attacking her will cause you to lose since she reflects damage and she has so many special abilities that it isn’t even funny. She’s certainly one of the strongest Yugioh characters of all time and she could definitely give some of the other OP final bosses of the franchise a good run for their money. 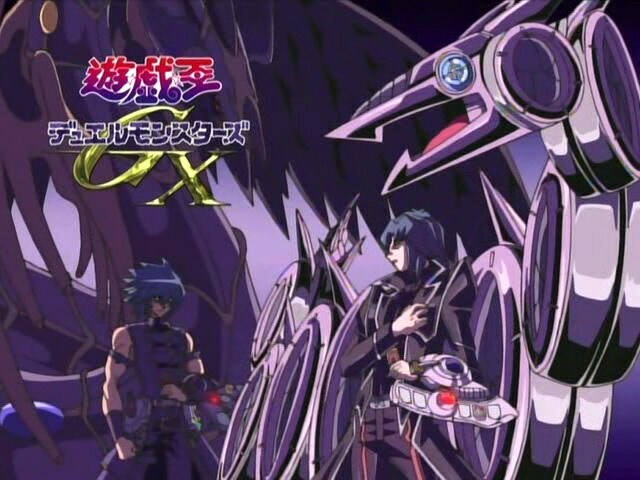 (Interestingly, the big boss of Zexal’s deck matches up against hers in a favorable way for him, but that’s another story) Yubel had great fights with Gecko, Jaden, and Zane. 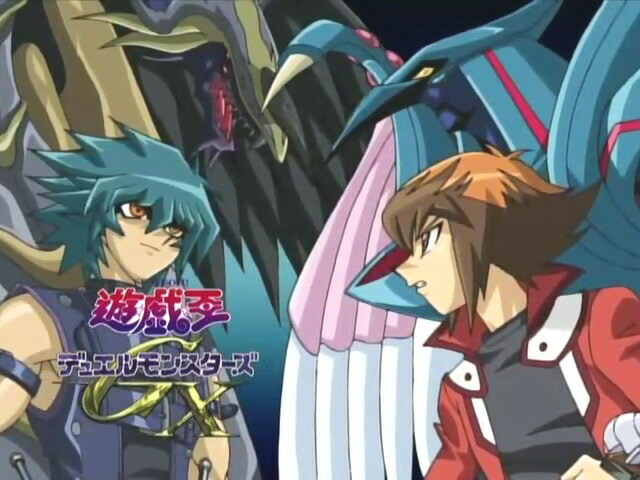 Each battle was great and Yubel always put up a terrific fight. Whether she was using the Sacred Beasts deck or her true one, you can bet that the heroes would not be able to rest easy. Tania is another one of the Shadow Riders who got to duel more than once. She humiliated Bastion when they fought so it makes sense that she would get to duel Jaden afterwards. I don’t care for her deck since it’s mostly made up of Tigers and other animals that are threatening in the real, but not in a fictional world with monsters. She may have actually gotten to appear in season 3, but she’s definitely not my kind of villain. She has a lot of determination and a fiery will, but it’s not enough to make her cool. Professor Viper is actually a pretty big villain in season 3, but it’s easy to forget him since he’s completely outshined by Yubel. One of the only reasons why I can picture him so clearly is because he got to make a cameo in the Bonds Beyond Time film. Every moment of that film is unforgettable so that’s mainly why I remember him. He was a pretty tough antagonist. Viper is definitely not likable, but he works for his role and the duel against Jaden was definitely very intense and one of the better moments of season 3. Brron is one of the sub villains of season 3 and really the only one who’s noteworthy. (Not counting Yubel, Viper, and Gecko) He is the villain who finally gets to crack Jaden. He took care of the supporting characters, which got Jaden riled up and he’s a decent duelist. The main thing that Brron overlooked was the fact that he simply wasn’t at the same level as Jaden. It’s a common mistake since villains tend to underestimate our invincible protagonist. As you can see, GX has a pretty colorful cast. Because of this, even the filler episodes are usually entertaining. There are some that are not great like the cooking contest, but they could definitely be worse. When the canon episodes do start though, they tend to run for quite a while without any interruptions and that’s always a good thing. The series has action, drama, and finesse. Three things that can be used to make a show great and GX naturally pulls them off without a fault. Season 3 was my favorite one with 2 being next and then 1 coming in third. Season 4 is still great of course, but it’s much shorter so it makes sense that it wouldn’t rank quite as high as the others. Overall, Yugioh GX is the ultimate show. It really has no negatives and the 180 episodes are a blast to watch. The soundtrack is dynamite and the animation is very good. Jaden is easily one of the greatest characters of all time and you’ll be hooked from start to finish. The plots get going pretty quickly here so it’s a thrill seeing the new villains each time. The seasons are typically 50+ episodes so that gives the show a lot of time to pace itself and allow the plots to progress naturally. If you haven’t seen this show yet then you’ll want to correct that immediately. I don’t know what your favorite show is right now, but watch this one and I have a feeling that it’ll get bumped down to second. It’s tough to be a perfect show, but GX comes closer than any other show could ever hope to reach. Update 03/31/2018 It is with a heavy heart that I have to announce that Yugioh GX has been surpassed. RWBY is now the greatest show of all time, but Yugioh GX will always hold a special place in my heart. This entry was posted in 9 Star TV Shows, Reviews, TV Show Reviews, TV Shows and tagged Anime, Anime Review, Aster, Card Show, Duel Monster, Jaden Yuki, Kaiba, Monsters, Review, Yugioh, Yugioh GX, Zane by dreager1. Bookmark the permalink. Great Review. Gx is my favorite Anime and it delivers in almost every aspect. Let’s See, I Don’t Know Much About Cardfight, Digimon Is Amazing, Pokemon Is Decent, Justice League Is Really Good, Avengers Is Even Better, I Never Liked Sword Art Online, Attack On Titan Isn’t Very Good, One Piece Is Awful, Naruto Had A Lot Of Potential But Wasted All Of It, Same With Bleach, I Don’t Know What Trigon Is, Full Metal Alchemist Is One Of The Best By Far, I Love Lucy Was Not Very Good, The Odd Couple Was Pretty Funny, Twilight Zone Was Great, The Honey Mooners Was Awful, Teenage Mutant Ninja Turtles Was Ok, Barney Was Terrible, Same With Powerpuff Girls, Breaking Bad Is Meh, Big Bang Theory Is Ok, The NFL Is Good, The Walking Dead Is Trash, Doctor Who Is FANTASTIC (lol) Star Trek Meh, Star Wars Is Decent, Godzilla One Of The Best, Same Goes For The Original Yu-Gi-Oh!, So In A Round About Way, Yu-Gi-Oh! GX Is By Far A Lot Better Than Everything Else In Media. Yubel Too Op Please Nerf lol. Yeah that card was krazy! GX Is Like A Fine Wine, It Only Gets Better With Age. At First I Thought Chazz Was My Favorite Character, But Now I Know It Was Zane Truesdale All Along. Yu-Gi-Oh! Is Still The Greatest Franchise Of All Time In My Opinion. Who Knows? Maybe One Day People Will Realize GX Is The Best Yu-Gi-Oh! Series Of All Time, Even Better Than 5D’s. I Can’t Wait For Yu-Gi-Oh! Vrains To Start Airing. I’ll Probably Wait For The Dub Though. Yeah that should definitely be awesome! Hm, those definitely sound like tough rules to follow. I guess it’s because some of these newer monsters were getting too strong or something. It’ll definitely take some getting used too though.